Hanging by a Thread by Sophie Littlefield. Review: Be careful. Stay in groups. Lock the door. And don't be Winston's next murder victim. That is the advice parents give their children in the cozy little coastal town of Winston, California. Sophie Littlefield's Hanging by a Thread, which is not in a series, takes place in the town of Winston. On the outside, Winston is just a normal, fairly small town. But truly, there is something horrid going on inside. Clare is a high school girl who ends up moving back to her childhood town of Winston. But what the rest of the town doesn't know is that Clare also has a secret. Clare Knight is a seamstress who puts together pieces of vintage clothing into something new. But what practically no one knows is that she has a blessing- or a curse, if you think of it that way: by touching a person's clothing, she can see parts of their past. No one knows about Clare's gift, except for her eccentric grandmother and her non-understanding mother. Everyone, including Clare, prays that this summer will be different from the last two, which have proved horrifying. The past two 4th of Julys haven't been exactly festive; each time, someone was murdered. While the town is trying to convince the media nothing is wrong, at the same time trying to calm themselves, Clare finds something that has the potential to uncover the mystery: the jacket of Amanda Stavros, last 4th of July's victim. Sophie Littlefield's Hanging by a Thread is the perfect mix of mystery, romance and suspense. I felt like I was in the place of Clare Knight, going through everything in the book, and I'm sure you will too. The characters were realistic and well rounded, and I could picture and feel everything that was happening. I give this book four-and-a-half stars out of five. The story has a meaningful moral, and shows you that things are never really what they seem. While Clare is busy trying to figure out exactly what happened on the 4th of July, her social and home life is falling apart as well. Clare suspects that her new crush may have something to do with the mystery at hand, and terror is the least of what she feels. Teens will relate to the problems in Clare's life, while enjoying the fantastical hints of magic and legend, curses and blessings. I would recommend this book to anyone 12 and up, although some parts may be inappropriate for children under sixth grade. Nevertheless, this story captivated me from the first word to the last. Very well written and packed full of suspense, Hanging by a Thread, is one of the best books I have ever read. The story has a meaningful moral, and shows about the dangers of holding a grudge and seeking out revenge. 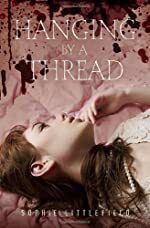 I enjoyed this book immensely, and I know you will too when you step through into the world of Clare Knight and watch as she deals with her life unraveling and soon merely hanging by a thread. We would like to thank Random House for providing a copy of Hanging by a Thread for this review. Have you read Hanging by a Thread? How would you rate it?